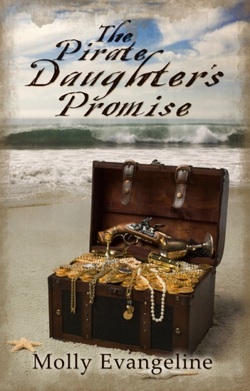 _I began writing The Pirate Daughter’s Promise late in 2003 after I saw Pirates of the Caribbean and thought it would be fun to write about pirates. It was the first time I had ever thought of writing a book with a Christian message though it started out as a typical, non-Christian pirate adventure. It was also my first story with any romance. I was quite the tomboy in my younger years so romance never occurred to me while writing before. The book went well until I just stopped writing it after the fifth chapter. I remember a strange feeling of opposition after I changed it to contain a Christian message. I think for that reason I quit writing it and went back to my other book projects. I hardly thought of it at all until May 2006 when I picked it up and began writing it again. I think I went back to it because that was right when Pirates of the Caribbean: Dead Man’s Chest came out, and I got back into pirates. Once I started writing again, I couldn’t stop. In all, the writing of that book took me two and a half weeks to complete, a time period I’ve never come even close to matching before or since. The completion of The Pirate Daughter’s Promise was the first time I ever seriously thought about trying to get published. It had always been a dream, but nothing more. A year later after I’d seriously begun to research it, I found the WinePress Publishing website and looked into self-publishing with Pleasant Word. One year after that, I had a published book in my hand and by that time I had Every Tear, book two, finished.